Unbeknownst to most, there is a tool that the Internet uses, which serves as its very own personal Google Glass—offering insights into our histories and preferences called the Digital Fingerprint. There is an industry behind this concept —to be exact a 39 billion dollar industry. 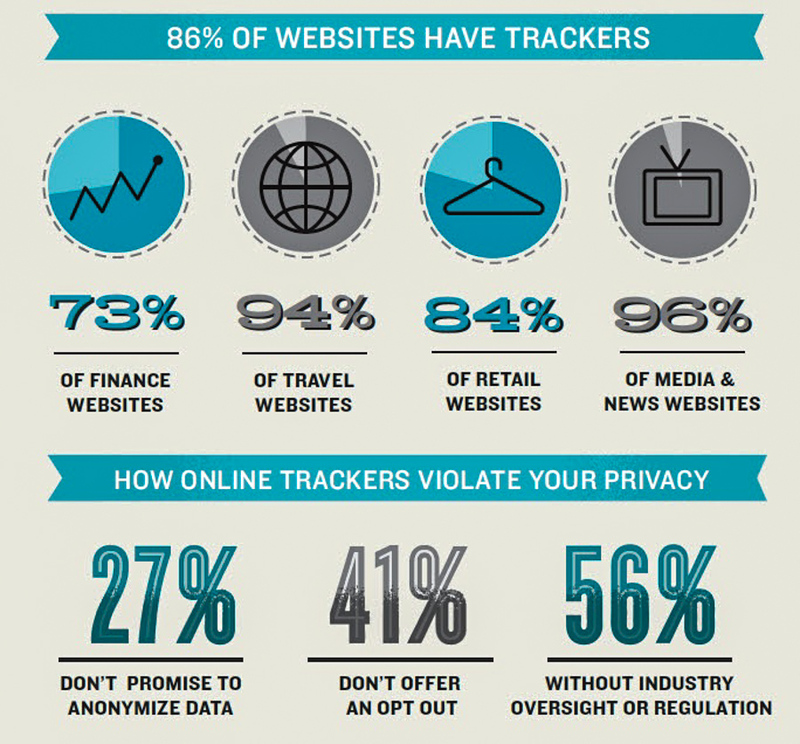 Behavioral tracking is a relatively new area, one with few rules and regulations, leaving consumers unprotected and vulnerable. With every click that we make online, somebody or “somebotty,” is making a note of this movement, compiling up a list of information on our habits online—forming a picture of our presence in the virtual space, and adding to our profiles without our consent. Today, with 2.5 billion of us around the world using the Internet at an alarming rate of increasing number of hours per day (8 to be exact), that’s a lot of information. As the industry is as unmonitored as it is, this information can be used for almost anything. Be assured that prowling private interests are making the most of it. As Gary Kovacs, tech pioneer and innovator, said in his Ted Talk, we may sometimes want for certain websites to understand our habits. It helps them filter out which information to present us with, which books to suggest, which pieces of news to point out. However, when we are not asked for our permission, that’s when it becomes a problem. While this information is available to intelligence agencies, they will never directly target most of us. This information, however, is paramount to publishers and advertisers around the globe, hoping to surpass the restrictions we set up on our computers that help block cookies or quickly extinguish them after browsing. As mentioned in Forbes, not allowing cookies makes it harder for companies to track our everyday online activities, putting billions of corporate dollars at stake. In the hunt for new ways to identify our needs and preferences, more and more of these advertisers are turning to the Digital Fingerprint, overcoming the cookies’ flaws. As Gary Kovacs pointed out, there is a plug-in called Collusion, which we can add to our browsers to show us exactly where our web data is going and who is tracking us. He continues in more detail, to speak of how the websites we visit are monitoring us, how third party websites are monitoring those that we visit, and fourth party websites (whom we cannot identify) are tracking those. All of this data is connected, and it forms a picture, visualizing our online steps. So how does marketing benefit from this data and our virtual profiles? Quite simply, the understanding of consumer behavior is improved—thus leading to more relevant and personalized targeting with services and product developments. For the visitor, us, this means the loss of control and privacy. This means that our information is being stored on a company server somewhere, being analyzed and manipulated for a future approach. CEO of startup AdStack, Evan Reiser, said: “There is a pretty fine line between cool and creepy.” While the use of this technology will help companies serve us better, we’re losing our freedom by willingly handing over our personal information. We’re losing the freedom of objectivity and are being showered with what can only appear as an option—but what in reality is a chosen list of options we can select from. This will inevitably lead to the deteriorating power of making our own decisions, the ability to lead ourselves as opposed to following, and the narrowing down of the diversity the Internet initially was intended to offer us. “Just as the Internet has opened up the world to each and every one of us, it has also opened each and every one of us to the world,” stated Kovacs. Ironically, with the direction Digital Fingerprinting is taking in the world of Advertising, the more we’re opened up to the world, the less the world is being opened up to us. We need to understand that just by using the Internet without security software such as a VPN (a service that disables anyone from being able to trace our activity back to us), we’re accepting that we’re handing over our freedom of choice. While we obviously will not stop using the Internet, as it’s become a vital part of our lives, the responsible thing to do is to understand the consequences, and make an effort to be as safe as we can in the virtual world. It is scary how much of our privacy we are giving away. Oh yes, it’s even scarier how little we pay attention to it. There’s this interview with John Oliver and Snowden that came out a few days ago, they had to focus the topic of privacy around Snapchat this time around, in order to get people’s attention.